Day 3 and we're under siege here at the Bender household. We are literally being attacked by Pirates. Fortunately, they're tiny pirates and we have members of the (British) armada to defend the land that is ours. But if the next blog post is vaguely cheeky or filled with "Arrs...", feel free to inform the authorities that we failed to hold the brig. Set 6253, Shipwreck Hideout, checks in at 310 pieces with six minifigures. It's got a cannon that fires, snakes, a parrot, a fish, a rope bridge, and enough cutlasses to properly outfit a pirate crew. While most men my age are beginning to think about hairpieces for themselves, I'm surprised to find that I'm starting to look more closely at the hairpieces for my minifigures. It's a little embarrassing to think that one of the reasons I bought this set was for the pirate wench, who has the same hairstyle as Agent Trace. The build was not terribly difficult. It's the kind of set that you don't have to focus very hard while constructing. That's not always a bad thing- it's like burning through a Grisham novel on a plane ride. Call this one LEGO brain candy. Although I'm not sold yet on the three numbered bags that led to building in phases. 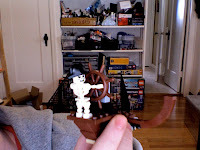 This one was ultimately about nostalgia for the old line that I never got to buy as a kid and a bit of fanboy joy at getting to own a part of my pirate/ninja/robot/dinosaur fascination in LEGO. Final verdict: Find a nephew and build it together. This one feels like you should have a kid involved in the construction process.